Soak tamarind and dates in 1cup water for 2-3hours. Add the soaked dates and tamarind in the blender/food processor and blend it to smooth paste. Now transfer the ground paste to the non-stick pan and cook on medium high flame for 3-4minutes. Add dry spices, cumin powder, black salt, dry ginger powder and simmer for 4-5minutes more. Store in the airtight container in the refrigerator and use it when required. If you prefer more sweet go ahead and add extra honey . Consistency can be altered by adding extra water while cooking. 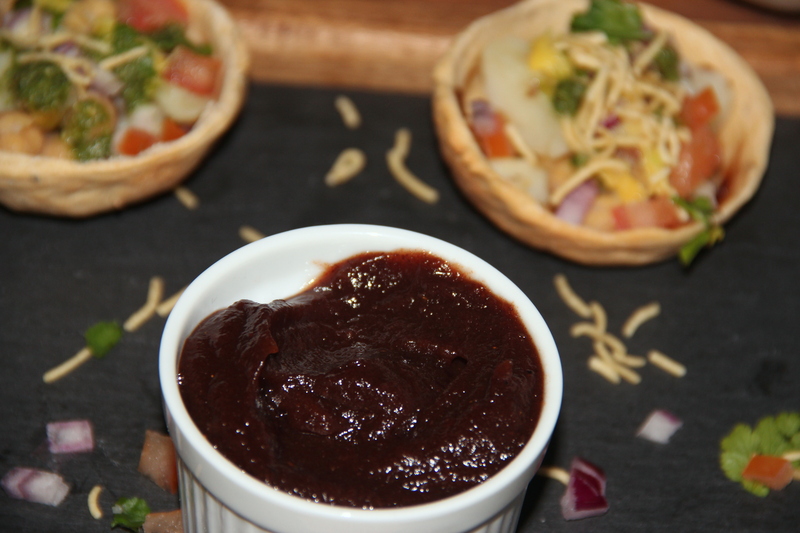 Posted on July 27, 2014, in Dips, Indian and tagged Chitras healthy kitchen, Dates Tamarind dip, drchdietfood, prakruthi honey, prakruthi honey bangalore, sweet tangy dip for chaats. Bookmark the permalink. 27 Comments. Lovely idea and super color !!!! This is a wonderful recipe from my friend Chitra Jagadish, please enjoy it! This is a perfect dip..!I would love this with a Packet of crackers! !